This past Thursday, October 6th, SNU held the event “Salsa Under the Stars” to celebrate Hispanic Heritage Month. It was held in the SNU library’s coffee shop. There was dancing, pan dulce and coffee. Hispanic Heritage Month is celebrated from September 15 to October 15. These dates are important as September 15 is the indepence day for several Latin American countries such as Guatemala, El Salvador, Costa Rica, Honduras and Nicaragua. It seemed best to have the month start on this date. Many people have some kind of event to celebrate this month, as Oklahoma city celebrates the month with their event :Fiestas de Las Americas. 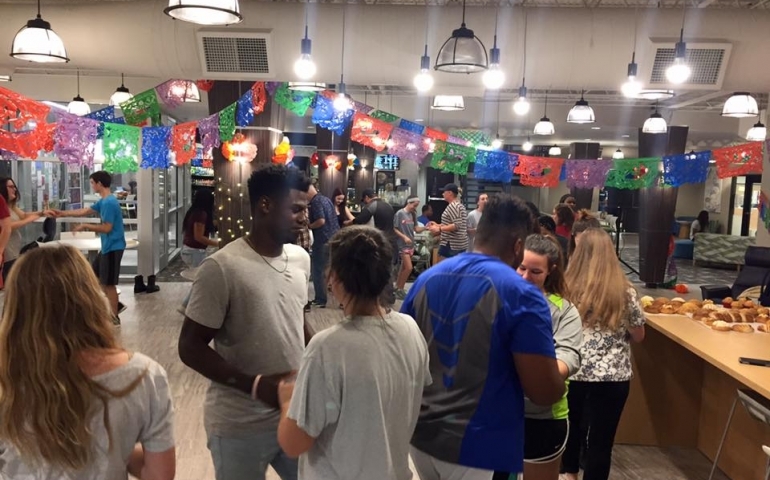 SNU held their own event called “Salsa Under the Stars,” sponsored by the Multicultural Student Organization. The event started with students reading pieces that reflected their own culture or from other great Latinx artists. Afterwards, students engaged in the dancing lessons provided by dancing instructor, Hazel Lopez. Students were first taught the basic steps of Bachata. At first, this is was met with much laughter and embarrassment. However, students begin to really engage in the dance and were asked to partner up. Soon after mastering the side steps, the dance became slightly complicated with spins added to the basic steps. Students were treated well as the instructor did not just stop at teaching Bachata. She also included lessons in Salsa. Students were taught two basic steps of Salsa. In addition to dancing with a partner, the instructor made all the students get into a big circle and, along with the beat, switch partners within the circle (essentially everyone danced with everyone). Students were laughing with joy and excitement. Throughout the dancing circle, one could hear them exclaiming “I love to dance” or whisper “1..2…3…4” to stay on beat. Hips were swayed, hair was flipped and lives were touched. Some students left after this lesson as it was getting late, but students who stayed were treated with an additional lesson in Merengue. They mostly gathered in a small circle and danced to “El Tiburón.” Afterwards, many students gathered to eat some pan dulce with coffee. The night was filled with fun moments and the Multicultural Student Organization can be thanked for that. They put much effort into making this event happen for students. The event was a great way to celebrate Hispanic Heritage Month and the many students who identify as hispanic/latinx on campus. Hazel Lopez is a dancing instructor at International Dance Studio and her website is http://idancestudio.com/ if one wants further information.